How fast is the Gospel spreading throughout the world? Dr. Reagan: I want to share something with you some amazing statistics about Christian world missions that I ran across recently. In 100 AD when the Church had just barely gotten started and had been going about 70 years, they were converting about 100 persons a day. By 1900 that was up to 1,000 people a day, so that was about 100 years ago. By 1950 nearly 4,000 came to Christ per day. By 1980 it was 20,000 a day. By 1990 it was 86,000 a day. By 1995 it was over 100,000 a day. And, by the year 2000 there were over 200,000 people a day accepting Jesus as Savior. That is what I call conversions on an exponential curve. It is amazing what is happening in these end times! Greg, tell us how in the world we can get from 1,000 Christian conversions a day in 1900 to 200,000 a day a hundred years later in the year 2000. How does that happen? Greg Pruett: Well, really, the population of the world has exploded from 1.6 billion to now 7 billion people in the world. But, not only that, but technology has just exploded as well. You can use radio and different forms of media, you can use the Internet, you can have cell phone access to the Gospel and to Scripture. All of these things have accelerated exponentially over the same time period. The access to Scripture has just exploded exponentially in the last few decades. Way back in the beginning, very few people had any access to Scripture in their own language, but during the last thirty years literally thousands of Scripture translations have been made. Beyond that, every kind of media has been used now in promoting the Bible such as The Jesus Film which is in 1,068 languages. Billions of people have seen it. Probably the most significant thing that has ever happened in the missions movement in the world today has been that now it is not sending missionaries only from Europe or from the United States, but the missionary movement has exploded out of Korea and from Brazil and all those different countries. Back in 1974, about 3,400 missionaries went out from non-Western countries, yet now it is over 103,000. That's literally 100,000 more! Dr. Reagan: The first factor you mentioned was radio, and I was thinking about the fact that in the 1960's I bought myself a short-wave radio. I'd never had one before. I turned that thing on and the most amazing thing to me was as I dialed it up I heard languages all over the world. I heard the name of Jesus in almost every language you could imagine. The atmosphere of this planet is saturated with the name of Jesus on the short-wave radio. With today's satellite television, I remember Billy Graham gave a sermon from either Puerto Rico or Jamaica several years ago, and it was carried by satellite television to over 100 nations in the world. In that one sermon he preached to more people than he had preached to in all of the history of Christianity before then. Such an outreach is truly just unbelievable. Greg Pruett: In 1974, Congress reported that two-thirds of the world's population was unevangelized, living in the least reached and unreachable places. By the times of the 1990's, people were talking about half the world's population. Here today you can look up the Joshua Project website and see the figure's about 40%. Dr. Reagan: One of the most amazing technological developments to me is the Internet. On the ministry's television program "Christ in Prophecy" we have access to 70 million homes in the United States, and we have access to every country in the world through 13 satellites. But, that is nothing compared to the access we have through the Internet. So, we have a full-time Web Minister who is on the Internet talking to people all over the world. Greg Pruett: The electronic outreach potential has gone beyond the Internet to cell phone technology. Right now our close partner "Faith Comes by Hearing" say they have 536 dramatized audio versions of the New Testament in 536 languages. They are all available now on the iPhone via two different Apps that you can use. Dr. Reagan: I was glad to hear you mentioned was The Jesus Film.. A lot of people don't know what that is, but it's the Book of Luke told word for word. The movie was filmed by Campus Crusade. They have over 1,500 teams showing the movie around the world right now, many using an old 16 millimeter projector hooked up to a car battery. Greg Pruett: I have shown it myself. It has been dubbed into 1,068 languages. Dr. Reagan: I checked and found they have shown The Jesus Film to six billion people total. They have 200 million conversions which is 21,000 a day or 630,000 a month comprising 7.5 million a year. 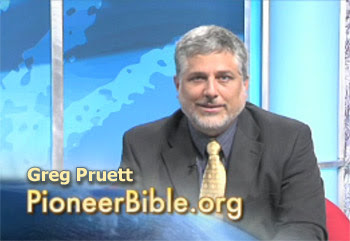 In the next part of my interview with Greg Pruett concerning Bible translation in prophecy, Greg will share how amazingly we've almost reached every people group and give an estimate about how long it will take to finish the job. Thanks for all the good works you guys do. How did you arrive at those conversion figures?